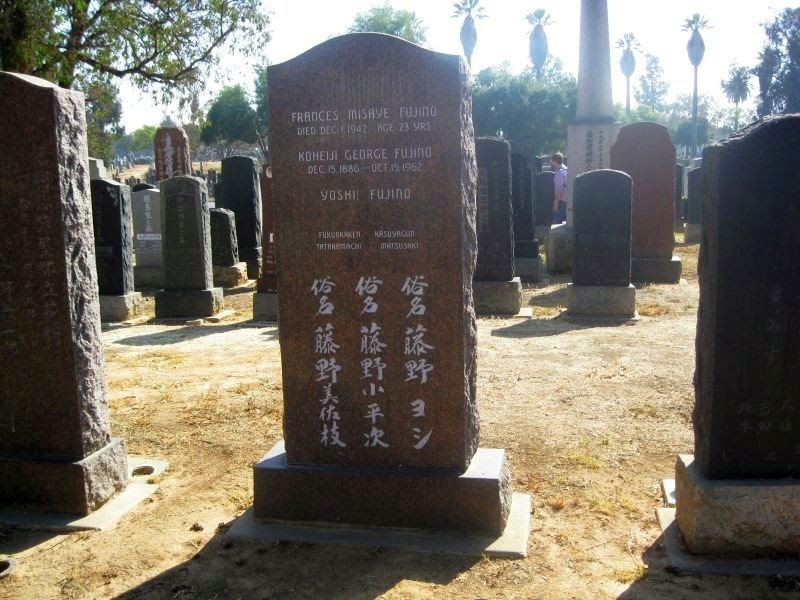 This is the shared marker for Frances Misaye Fujino and her parents, Koheiji Fujino and Yoshi Kobayashi Fujino. Yoshi’s birth and death dates aren’t on the stone so I’m not sure whether or not she is actually buried in Los Angeles’ Evergreen Memorial Park and Mausoleum. Since I took this photo in October 2013 I’ve researched Frances’ story on and off, halted by dead ends (no pun intended). Her story was particularly interesting and tragic because she and her family lived at the Manzanar relocation camp during World War II. While information pertaining to her cause of death has eluded me, we know that Frances died at Manzanar on December 1, 1942 at age 23. Frances was born on September 26, 1919 in Orange County, California. 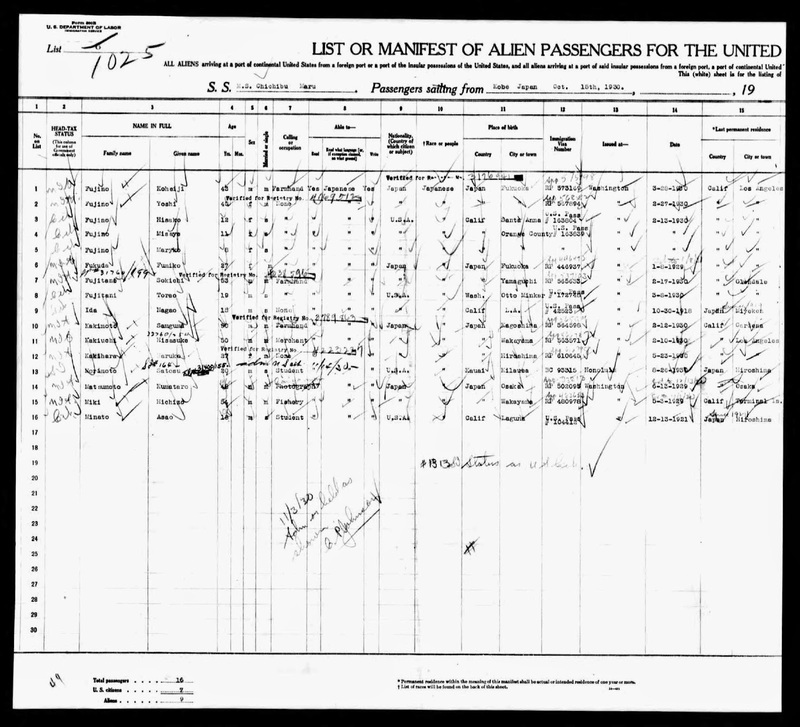 Based on the 1930 census she was the third of four children: Harry (15), Mary (13), and Alice (7). 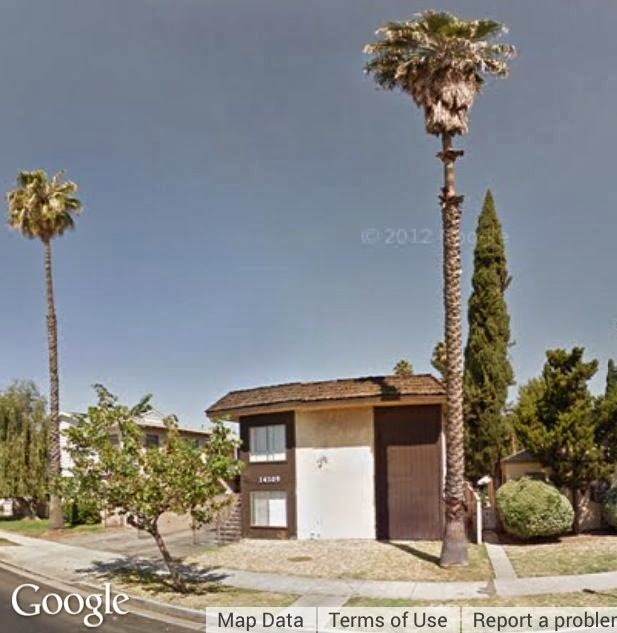 The family lived at 1812 Ballona or Ballova Avenue (or at least that’s what the handwriting appears to read). The patriarch of the family was a farmer. Pieces of information specific to Frances were few and far between, but there were some a few items told a little bit about her life. For example, in October 1930 the family returned from a trip to Japan on the SS MS Chichibu Maru. I stumbled upon a yearbook photo attached to the name “Frances Fujino” but the caption gave a different first initial, making me wonder if the Fujino in the photo was actually our Frances, incorrectly identified by a yearbook typo. 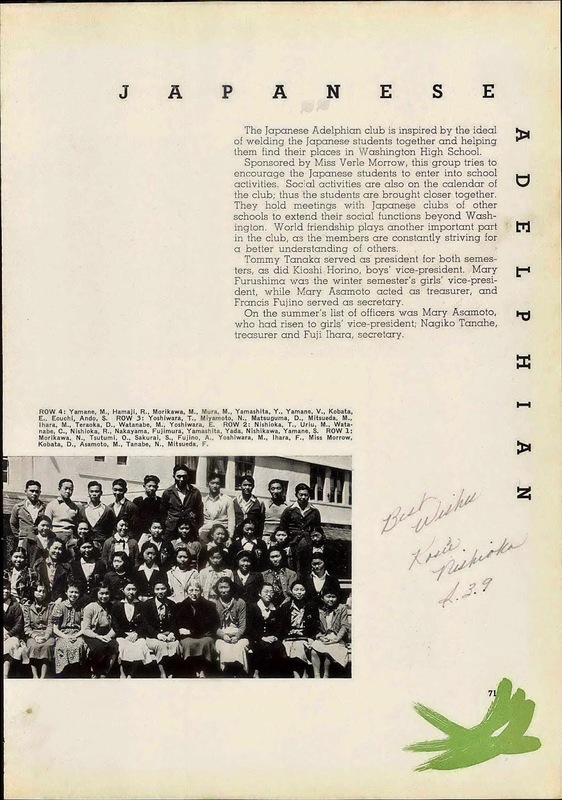 This page is from the 1938 George Washington High School Yearbook. “A. Fujino” is seated on the front row, fourth from the left. After the attack on Pearl Harbor in December 1941 life changed dramatically for Japanese Americans living on the west coast of the United States. Paranoia and hysteria prompted the February 1942 signing of Executive Order 9066, which gave the military authority to send anyone seen as a threat to the war effort to internment camps. In this case, that meant people of Japanese ancestry. Citizens were only given a short period of time to make arrangements for their belongings before being evacuated to one of ten camps. Many citizens had no choice but to abandon everything. Those who were able to sell their property took a loss because the market was flooded. Around 120,000 total Japanese Americans were imprisoned during the years that the camps were in operation. The Virtual Museum of San Fransisco has a timeline of events prior to and after Executive Order 9066. I highly recommend that you read through the site, as this post alone can’t possibly cover everything that needs to be said about the unconstitutional and unjust treatment of these people. The Fujino family “relocated” to Manzanar, a camp about 220 miles north of Los Angeles on June 1, 1942. Manzanar’s geographical location in Owens Valley between two mountain ranges was prone to dust storms, scorching temperatures in the summer, and below freezing conditions in the winter. Residents were surrounded by barbed wire fences and armed guards posted at eight watchtowers. Frances experienced a severe lack of privacy and could have been housed with other families in very cramped quarters. The hurriedly-built barracks at Manzanar were divided into 20 by 25 ft. spaces with only a thin wall (no ceiling) separating each family. Bathroom facilities were communal with no stall doors, further stripping residents of their dignity. Items we take for granted such as toilet paper, were often in short supply. Among the sparse furnishings provided were an oil stove, blankets, one hanging light bulb, and straw mattresses. Over time the residents of Manzanar attempted to settle into some kind of normalcy despite their lack of freedom and the harsh environment. Schools, temples, clubs, barber shops, banks, and other businesses were formed. There were recreational activities and evacuees started their own newspaper. People farmed, served as medical personnel, teachers, and functioned in other occupations around the camp. Many made clothing and furniture to earn money. The extent of Frances’ participation in these activities or vocations would be purely speculation but no matter how involved she was in her new community, she wouldn’t survive to see real freedom again.